Other Rules:All minor races No strong races, this takes up a slot. 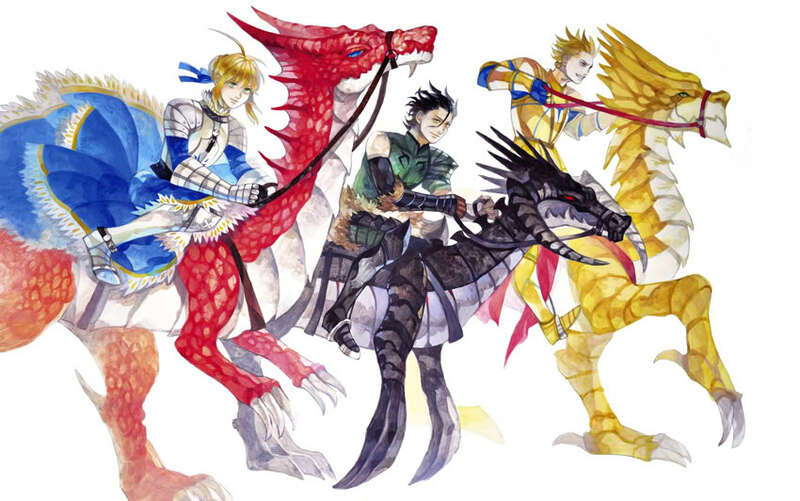 Lore: The Dragon Riders history goes all the way back when Gisildaigaon was first created. The settlers who began to create their home were struggling getting used to the environment. The rough mountains made it hard to travel about without getting fatigued easily, the forests were mysterious and the settlers weren't armed well enough to hunt the dangerous animals there for food, and things only grew complicated when they didn't know which berries, mushrooms, and herbs were poisonous or not. The settlers of Gisildaigaon began to loose morale and hope, their children were growing starved and ill and it seemed as though most things were lost. Still, their leader Irreyl Gisildaigaon knew there was a reason for coming here. He knew the Gods wouldn't have sent him here without reason. Irreyl has lost many men and women on his travel here, and now his people were starving. He couldn't let this all go in vain. Irreyl slept one night, and a golden dragon appeared in his dream. "Stygian" is what he called himself, even without speaking yet Irreyl could feel the large amounts of knowledge this dragon had. 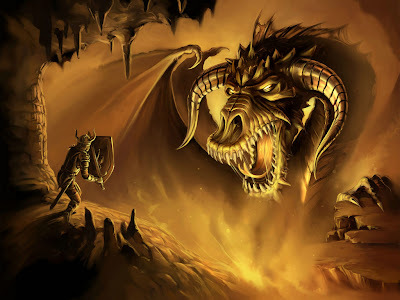 Stygian finally spoke and had him that he was the adviser of the King Dragon here in the mountains. The mighty red dragon called, Andras. As Stygian continued, he told Irreyl, the leader of the Gisildaigaon that he must seek out Andras deep in a mysterious cavern deep within the forest, alone. Irreyl woke from this dream drenched in sweat, it all seemed too real everything from the dragons breath, to the ground he stood on seemed to be real within his dream. But something tugged at his heart, to go to this cavern, he'd have to leave his dieing people here without their leader for several days. Or he could ignore the dream and be unsure what the truth to this matter was. He was stuck between these two choices, and the fate of his people all decided on making the right one. So he decided... He'd rather die without knowing the truth. Thus, early in the morning before all the others awoke he made his way into the forests. For three days, Irreyl traveled into the forests with very limited water and food. He knew from within these forests -he- was the prey and all the other animals were the hunters. Thus, he'd have to be stealthy and sly in order to make his way to these fabled caverns. Still, within the forest everything looked the same and made it very easy to get lost. He knew, he'd only have his heart and feelings to follow. The three days were long and hard, and his people were constantly on his mind. The young settler found himself within a glorious jeweled cavern. Where several assorted dragons were resting, but one stood out more than the other. A Giant Red Wveryn was in the middle standing proud and tall. A knowing grin was showing on it's face showing it's glorious sharp teeth. The two spoke about the dream, the situation about the settlers. But Andras already knew all too well about the situation, as he knew about everything within these lands. Andras extended a invitation towards Irreyl. If Irreyl could grow a kingdom, and an army that would joint with the dragons he would make an alliance with him and help him settle. The young hero had no choice but to accept. Andras had given Irreyl the aid of three dragons; The Red Dragons, were strong... powerful and to lift and smash things with ease. They were able to help build, hunt, and destroy things for materials. The Wyverns were agile, quick, and were able to fly faster than the other dragons. The Wyvern were used to get people in and out of the mountains with their immense speed, or help gather materials quickly. The Golden Drakes, their knowledge was immense and they had the best looking scales that glowed a beautiful golden. These Golden Drake's taught the settlers how to read, write, and educated them about the lands and other professions such as black-smithing, herbalism, and more importantly helped advanced their culture. With this, the land of Gisildaigaon began to grow and Irreyl was named a leader... and their first king. Recent Events: The Drake Riders are now an organized branch within the Gisildaigaon Army. Though Drake Riders aren't picked lightly, and becoming one is considered prestigious. A Drake Rider, also must have a special bond with their Drake since the two are considered "one". The Army has now even gone as far as having members be "chosen" by a drake, or raise a drake themselves in order to even be qualified to take the tests to become a Drake Rider. 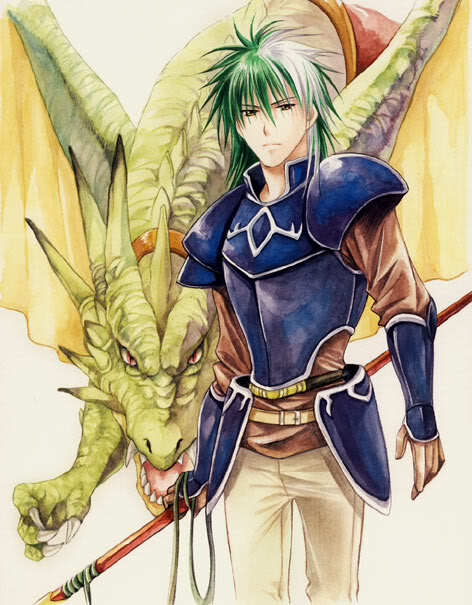 The most famous Drake Rider is currently King Shamus Gisildaigaon who now rides Andras the IV, leader of the Drakes. Rider and Dragon count as separate targets and have separate stats. Rider and Dragon share a single turn either may take action on offense. Powers are for Dragon only, Tech Tree is for Rider only.. This class is restricted from Dual Wield. Description: The Drake slashes the enemy across the chest using sharpened claws, making a devistating wound that would be hard to come back from. DF Effect: Causes a Melee Attack to Cause the Target to Suffer 2 Bleed Damage the Next Round on the user's Turn. Description: The Drake moves forwards towards the enemy clawing them twice with it's claws. DF Effect: This is two attack rolls, each one deals 1d6+1 Damage, Strength Bonus Damage is added to the final damage. Other Rules: Always Human, Holding Minor Dragonic Traits, They Generally Live to be a 350 Years Old, They Age normally until they hit age 21 then they only Seem to age one Year physically for every seven that pass. General Bonuses: All Dragon Hunter's Gain a +2 to all Rolls vs. Dragons/Dragon Kids, They May Roll Concentration to Replace both Listen/Spot/Search, They have a +3 to all spot and concentration rolls. General Information: General Information: The group started as a normal collection of humans, whom had lost their families and friends to Dragons. At first this did not go well, as Dragons were godly creatures...normal men could not face them alone. Even with an army, taking down a dragon seemed an impossible feat to accomplish. It was around this time they began to seek other methods to slay the dragons. Eventually, through a mixture of magical ritual, and special training, they managed to discover a method in which they could rise to combat the dragons. It took time, but after many years they had finally begun to perfect the transformation. Eventually, as their power grew, they became capable of combating dragons effectively, much to the surprise of many. The group took to calling themselves Dragon Hunters. In secret, they trained to better combat the dragons, and as years passed it became evident that they could not proceed without more mental discipline. As such, they sought out orders of Monks, explaining to them their cause, and wishes to take up training in martial arts. As centuries passed, they learned more about the changes brought upon them by the rituals they had used, namely that they aged at a much slower rate, and began to take on various traits similar to that of the dragons themselves. Though these traits were minor, and differed between individuals, seemingly at random. It was discovered, that those whom were more in tune with their emotions began to progress even further then the rest, depending on the element they were attuned towards, and eventually, they broke into five branches, a branch representing each element. Over time, people began to recognize these people for what they were attempting to accomplish, and instead of being hated for their what they had become, people began to support them. Specifically, those who had been affected in some way by the Dragons, as until that time all hope seemed lost. Eventually, the dragons vanished from the world, leaving only sparse remnants of what once was. The amount of people who remembered the Dragon Hunters diminished, and over time they were largely forgotten. Even now, however, the Dragon Hunters continue to train promising students. They bide their time, honing their skills, so that they might be prepared should the Dragons ever return. Each Dragon Hunter is Born with a Natural Elemental Power and Affinity, Because of this All Spells are Changed into that Element. Their Elements all Very with their Strongest Emotions. Fire/Lava, Burning Claws The Fire Branches Dragon Hunter's have used their training to cause Heat and flames to form along their claws, causing their impact damage to be far greater and burn as well as pierce and slash their targets. Fire/Lava, Burning Organs: The Fire branches Dragon hunters have the ability to misdirect attacks and spells of their element, and attempt to devour it. Due to their physical changes, their bodies can take on even the most dire forms of their element, and use it to recover to an extent during battle. However, higher rank spells cannot be absorbed due to the amount of magical energy involved. - PvP Effect: - PvP Effect: Can attempt to devour Rank 0-3 Fire/Lava-Based Spells/Magic, rolling highest stat versus highest stat. If devoured, the hunter takes half of mana that was used to cast the spell. They can then either place the points in HP or MP, or they can split it between the two. Example: P1 casts a spell that costs 8 mana on P2. P2 rolls to devour the spell, as it's his/her element. P2 Succeeds, and can place 4 points in his HP or MP, or 2 points in both. Water/Ice, Chilling Claws The Water Branches Dragon Hunter's have used their training to cause Ice and water to form along their claws, causing their impact damage to be far greater and Freeze as well as pierce and slash their targets. Water/Ice, Chilling Claws The Water branches Dragon hunters have the ability to misdirect attacks and spells of their element, and attempt to devour it. Due to their physical changes, their bodies can take on even the most dire forms of their element, and use it to recover to an extent during battle. However, higher rank spells cannot be absorbed due to the amount of magical energy involved. - PvP Effect: Can attempt to devour Rank 0-3 Water/Ice-Based Spells/Magic, rolling highest stat versus highest stat. If devoured, the hunter takes half of mana that was used to cast the spell. They can then either place the points in HP or MP, or they can split it between the two. Wind/Storm, Swirling Claws The Wind Branches Dragon Hunter's have used their training to cause wind blades to form along their claws, causing their impact damage to be far greater and Tear as well as pierce and slash their targets. Wind/Storm, Swirling Organs The Wind branches Dragon hunters have the ability to misdirect attacks and spells of their element, and attempt to devour it. Due to their physical changes, their bodies can take on even the most dire forms of their element, and use it to recover to an extent during battle. However, higher rank spells cannot be absorbed due to the amount of magical energy involved. - PvP Effect: Can attempt to devour Rank 0-3 Wind/Storm-Based Spells/Magic, rolling highest stat versus highest stat. If devoured, the hunter takes half of mana that was used to cast the spell. They can then either place the points in HP or MP, or they can split it between the two. Earth/Metal, Piercing Claws The Earth Branches Dragon Hunter's have used their training to cause Spikes or rock and earth to form along their claws, causing their impact damage to be far greater and rend as well as pierce and slash their targets. Earth/Metal, Organs of Durability The Earth branches Dragon hunters have the ability to misdirect attacks and spells of their element, and attempt to devour it. Due to their physical changes, their bodies can take on even the most dire forms of their element, and use it to recover to an extent during battle. However, higher rank spells cannot be absorbed due to the amount of magical energy involved. - PvP Effect: Can attempt to devour Rank 0-3 Earth/Metal-Based Spells/Magic, rolling highest stat versus highest stat. If devoured, the hunter takes half of mana that was used to cast the spell. They can then either place the points in HP or MP, or they can split it between the two. Lightning/Sound, Shocking Claws The Lightning Branches Dragon Hunter's have used their training to cause Electricity ad Lightning to form along their claws, causing their impact damage to be far greater and Shock as well as pierce and slash their targets. Lightning/Sound, Shocking Organs The Lightning branches Dragon hunters have the ability to misdirect attacks and spells of their element, and attempt to devour it. Due to their physical changes, their bodies can take on even the most dire forms of their element, and use it to recover to an extent during battle. However, higher rank spells cannot be absorbed due to the amount of magical energy involved. - PvP Effect: Can attempt to devour Rank 0-3 Lightning/Sound-Based Spells/Magic, rolling highest stat versus highest stat. If devoured, the hunter takes half of mana that was used to cast the spell. They can then either place the points in HP or MP, or they can split it between the two. Fire/Lava, Burning Claws The Fire Branches Dragon Hunter's have used their training to cause Heat and flames to form along their claws, causing their impact damage to be far greater and burn as well as pierce and slash their targets. However now Enhanced by their own Internal Gem they have Devoured and Absorbed, their powers have Quadrupled in levels of energy, resilience and techniques, Causing their elemental power's and claws to Skyrocket. Fire/Lava, Burning Organs The Fire Branches Dragon Hunter's have used their raining so that their internal organs can absorb and take on incredible amounts of heat, allowing them to literally swallow their own element from and outside source and use it to restore their own energy. However now Enhanced by their own Internal Gem they have Devoured and Absorbed, their powers have Quadrupled in levels of energy, resilience and techniques, Causing their Internal organs endurance to Skyrocket. - PvP Effect: Resistance to Rank 0-5 Fire/Lava-Based Spells/Magic. When hit with a Fire/Lava-Based Attack/Magic/Spell of any sort they are Healed the same amount of MP as it took to Cast/Use the Attack/Magic/Spell. Water/Ice, Chilling Claws The Water Branches Dragon Hunter's have used their training to cause Ice and water to form along their claws, causing their impact damage to be far greater and Freeze as well as pierce and slash their targets. However now Enhanced by their own Internal Gem they have Devoured and Absorbed, their powers have Quadrupled in levels of energy, resilience and techniques, Causing their elemental power's and claws to Skyrocket. Water/Ice, Chilling Claws The Water Branches Dragon Hunter's have used their raining so that their internal organs can absorb and take on incredible amounts of Cold, allowing them to literally swallow their own element from and outside source and use it to restore their own energy. However now Enhanced by their own Internal Gem they have Devoured and Absorbed, their powers have Quadrupled in levels of energy, resilience and techniques, Causing their Internal organs endurance to Skyrocket. - PvP Effect: Resistance to Rank 0-5 Water/Ice-Based Spells/Magic. When hit with a Water/Ice-Based Attack/Magic/Spell of any Sort they are Healed the same amount of MP as it took to Cast/Use the Attack/Magic/Spell. Wind/Storm, Swirling Claws The Wind Branches Dragon Hunter's have used their training to cause wind blades to form along their claws, causing their impact damage to be far greater and Tear as well as pierce and slash their targets. However now Enhanced by their own Internal Gem they have Devoured and Absorbed, their powers have Quadrupled in levels of energy, resilience and techniques, Causing their elemental power's and claws to Skyrocket. Wind/Storm, Swirling Organs The Wind Branches Dragon Hunter's have used their raining so that their internal organs can absorb and take on incredible amounts of Pressure, allowing them to literally swallow their own element from and outside source and use it to restore their own energy. However now Enhanced by their own Internal Gem they have Devoured and Absorbed, their powers have Quadrupled in levels of energy, resilience and techniques, Causing their Internal organs endurance to Skyrocket. - PvP Effect: Resistance to Rank 0-5 Wind/Storm-Based Spells/Magic. When hit with a Wind/Storm-Based Attack/Magic/Spell of any Sort they are Healed the same amount of MP as it took to Cast/Use the Attack/Magic/Spell. Earth/Metal, Piercing Claws The Earth Branches Dragon Hunter's have used their training to cause Spikes or rock and earth to form along their claws, causing their impact damage to be far greater and rend as well as pierce and slash their targets. However now Enhanced by their own Internal Gem they have Devoured and Absorbed, their powers have Quadrupled in levels of energy, resilience and techniques, Causing their elemental power's and claws to Skyrocket. Earth/Metal, Piercing Claws The Earth Branches Dragon Hunter's have used their raining so that their internal organs can absorb and take on incredible amounts of Density, allowing them to literally swallow their own element from and outside source and use it to restore their own energy. However now Enhanced by their own Internal Gem they have Devoured and Absorbed, their powers have Quadrupled in levels of energy, resilience and techniques, Causing their Internal organs endurance to Skyrocket. - PvP Effect: Resistance to Rank 0-5 Earth/Metal-Based Spells/Magic. When hit with a Earth/Metal-Based Attack/Magic/Spell of any Sort they are Healed the same amount of MP as it took to Cast/Use the Attack/Magic/Spell. Lightning/Sound, Shocking Claws The Lightning Branches Dragon Hunter's have used their training to cause Electricity ad Lightning to form along their claws, causing their impact damage to be far greater and Shock as well as pierce and slash their targets. However now Enhanced by their own Internal Gem they have Devoured and Absorbed, their powers have Quadrupled in levels of energy, resilience and techniques, Causing their elemental power's and claws to Skyrocket. Lightning/Sound, Shocking Organs The Lightning Branches Dragon Hunter's have used their raining so that their internal organs can absorb and take on incredible amounts of Electricity, allowing them to literally swallow their own element from and outside source and use it to restore their own energy. However now Enhanced by their own Internal Gem they have Devoured and Absorbed, their powers have Quadrupled in levels of energy, resilience and techniques, Causing their Internal organs endurance to Skyrocket. - PvP Effect: Resistance Rank 0-5 Lightning/Sound-Based Spells/Magic. When hit with a Lighting/Sound-Based Attack/Magic/Spell of any Sort they are Healed the same amount of MP as it took to Cast/Use the Attack/Magic/Spell. A lich is an undead spellcaster who has used its magical powers to unnaturally extend its life. Liches are scheming, and to some, insane. They hunger forever for greater power, long-forgotten knowledge, and the most terrible of arcane secrets. Because the shadow of death does not hang over them, they often conceive plans taking years, decades, or even centuries to come to fruition. A lich typically begins as a sorcerer, wizard, or sometimes a cleric. It either sought power or knowledge and one day e could live forever. Phylactery gives resistance but not immunity to perma situations, but if it is destroyed, the lich becomes vulnerable to perma even more.